It was the Katy Tiger vs. the A&M Consolidated Tigers. The first game in a High School Football double header. The game was made up of big plays, turnovers and big mistakes. Neither team embarrassed themselves and showed some great talent and moments of good play execution. There were also moments of pre season flubs on both teams and on both sides of the ball. I would estimate that about 12,000 fans were on hand to cheer on the their team. In the end Katy won the contest 21 to 14. Both teams should have a good season. 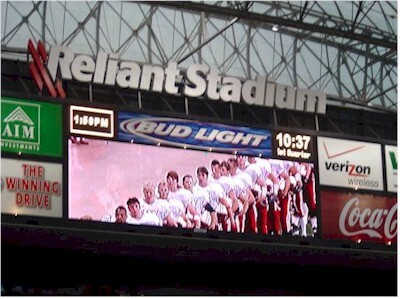 Click below to see the opening kick off of the first High School game in NRG Stadium. Katy kicked off to A&M Consolidated and they had a big running back. 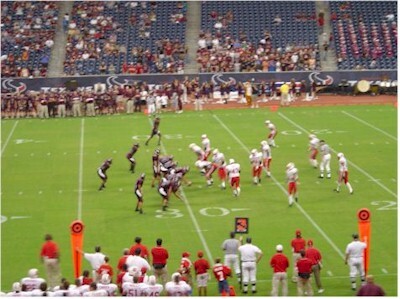 NRG Stadium, home of the Houston Texans, the Super Bowl XXXVIII and the now infamous "costume malfunction" hosted its first high school football game August 28th, 2004. The past few years the High School games played at the "NRG Astrodome", located just across the parking lot, have been understaffed and the facilities in a generally unkempt condition. Diamond vision? forget about it, they wouldn't even turn it on. Event staff? They seemed bothered that you were even there. Concessions? Underserved and over priced. How did the NRG Stadium measure up to the Dome experience? No comparison. The facility was clean, the event staff was courteous. One NRG employee even greeted everyone as they left, thanking them for coming to the stadium. The stadium atmosphere gave this "0" week pre-season game a playoff feel and excitement that is hard to come by in an August game. The A&M Consolidated Tigers kept the Katy Defense on the run most of the game.